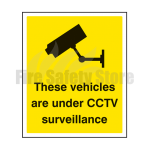 CCTV notification signs are required under the Data Protection Act and we stock a variety here at Fire Safety Store. We have a variety of slogans stating that either your premises, organisation or vehicles are under CCTV surveillance. Our CCTV signs are clearly visible, easy to read and made from rigid plastic so can cope in outdoor environments. For more information check out product pages of if you still have questions, use our Freephone number to contact our customer service team.